All of the human beings I have ever known have been prone to making a choice that they wished they hadn’t made after the fact. There’s not a single exception in my book and there’s probably not an exception in your book either. But why do we do this? Why do we make choices that go against what we ‘say’ we want? Choices that take us AWAY from our goals rather than toward them? There is an organization out in the world which offers amazing personal growth workshops and seminars called Landmark Education. They do good work and my partner, Steve, of 14 years, has attended many of their programs. He has said many times he couldn’t have gotten this far without the lessons he learned from Landmark. The cool part is that while I wasn’t involved in their program, I got to reap many lessons over the years because he and I love to share what we learn out in the world with each other so both of us are on the same page and benefit from the awareness (which is what most of it is). Several years ago, he took one of their eight week specialty classes and the principle concept we came away with was the idea of ‘it’. And IT fits into the topic here perfectly as you’ll soon see. This isn’t what people mean when they say, ‘someone got it’ or ‘don’t you get it’, however, I think this particular concept of IT may just change everything for you. It did for us. Are we human or bug or both? Before we jump into exactly what IT is, we need to talk about bugs for a bit and yes, I said bugs. From what we’re learning from science the past several years, we have more foreign (bug) DNA in us than we do human DNA. That’s kind of a weird and bizarre thought to me but evidently, when we’re healthy, it’s a good thing they are there. Those non-human beings help out in untold ways with the functioning of our bodies. But what about the bugs who shouldn’t be there? The bugs who invade our livers or guts or brains or any other place they shouldn’t be and make us sick? What about THESE bugs? Well, this is exactly what I want to talk about today. Remember the last time you got up in the morning with the most powerful of intentions of eating well, or taking a nap or getting some exercise or taking all of your supplement in order to heal? We all have those days where we wake up feeling like Super Being. Those days feel great, don’t they? But then something happened? You saw the chocolate on the shelf in the store or someone offered you a piece of wheat breat and bam!, out the door went your intentions. What results is that you not only made a poor choice relative to your health goals but you might also have felt guilty, ashamed, weak or any of the other handful of negative thoughts and emotions that us human beings experience when we make a choice that we know in our hearts and guts is a wrong choice. What I learned from Steve’s class those many years ago was that when I want something that doesn’t align with what I SAY and KNOW I want at a heart level, it’s not ME who wants the thing, it’s IT who wants it! IT can be the unwanted bugs who need white sugar or yeast or whatever to live and they are influencing your system so you experience a craving for sugar or wheat or alcohol for instance. IT can also be what Steve calls a Secondary want or desire that, for whatever reason, surges to the Primary spot momentarily, just long enough to influence you and then it goes back to where it belong, in lowly second place. This Secondary can be a fear or past belief or any number of other emotions or mental habits that tend to get in your way from time to time. Keep in mind that IT can cause you to DO things you don’t really want to do and NOT do things you DO really want to do. Either way, the end result is not healing as quickly as you might otherwise heal. You can say it out loud or say it to yourself. Steve and I tend to say it out loud when we’re together and I tend to say it to myself if I’m alone. What really matters is that you SAY it! The biggest challenge I find with this concept, and I do use it often, is simply to reMEMber to use it. Once I reframe a statement like, “I’d really love some popcorn this evening,” to “Oh, ya, IT wants popcorn. 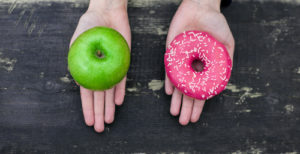 I want to be healthy so I’ll have an apple instead,” all of a sudden, I’m back in control and I follow through with my commitments to my healing and my priorities of getting well. My suggestion, if you can use this concept and tool for your Healing Tool Chest, is to put a note on your fridge or cabinet or whereever else you notice yourself veering from your stated path that simple asks..
Once you master the “I vs IT” question, you’ll be pleasantly surprised by your ongoing dedication to your health goals. Now go make those signs and kick IT to the curb from now on knowing who’s really in charge.